All Over Coffee was created in September 2003. That November the strip was picked up by the San Francisco Chronicle and in February 2004 began running 4 days a week; 3 days in the daily Datebook section and Sundays in the Pink section. After a year and a half and 200 daily strips, the strips grew more complex, so went to Sundays only. All Over Coffee still runs in the large format one day a week in the Sunday Pink Section of the Chronicle, on SFGate.com, and The Rumpus. In 2007, after just over 300 published strips, City Lights Books published the first collection in a full color hardcover edition titled All Over Coffee, and in 2010 published the second collection, Everything is its own reward. An explanation of All Over Coffee is that it's a comic strip without the comic. The series is about storytelling using image and text in nontraditional ways. 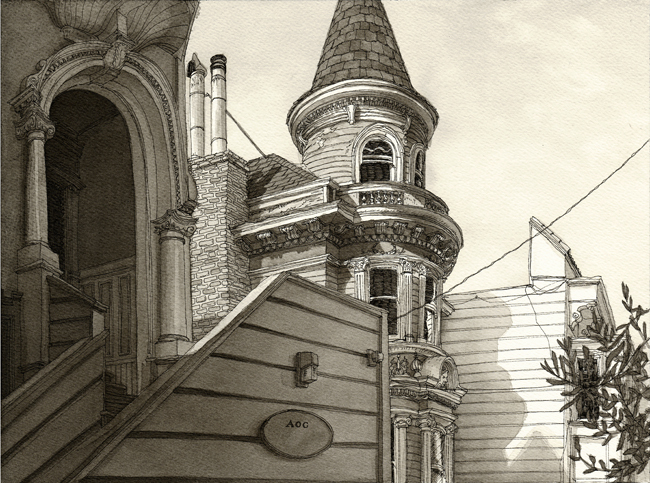 The relationship between story and drawing is tonal and not literal, what I call nonlinear. This is in contrast to how most stories employ images, which is what I call parallel. Parallel relationships use illustrations that tranlate literally what the text has already told. Nonlinear relationships combine disparate elements to create a gap, allowing the reader to make associations. Read more on the history and process All Over Coffee in the afterwords of both book collections. New strips include collaborations with authors. Go here to read more about collaborative strips. This is an apt piece to make the first official announcement for the new All Over Coffee book. The first book, titled simply All Over Coffee, was published in 2007 by City Lights Press and is currently in its 4th printing. The upcoming second book, Everything Is Its Own Reward, is due out March 2011. This current strip is from Buenos Aires and serves as a mission statement for the new book. The last line (and title of the book) was originally taken from strip #390, published 01 13 2008, of the De Young Museum in San Francisco. As I was concepting this new book of All Over Coffee strips, this line kept surfacing in my mind. Of all the themes I pursued over the past four years and two hundred strips, this one stuck out as the over-arching theme that defined the work, how I felt about my practice, and what it means to dedicate oneself to a life of artmaking—or to anything at all. As much as I enjoy letting pieces hover in a range of possible uncertain understanding, I was inclined to write more on the subject. And so this strip was made (as will the next 8 to 10 strips) as both its own piece and with the new book in mind, to fill out the composition of the collection. During the months of June and July 2010, a show of 30x40 inch All Over Coffee prints are being shown in the SFMOMA cafe in San Francisco. This is the second of two drawings from the museum to honor my toe in the door of the MOMA. What may be even more monumental than the MOMA Cafe show for me is this introduction of a figure into All Over Coffee. I've published three drawings of people in the past 500 hundred strips; two were sketchbook pages, which I'm not really counting as full fledged strips, and the other was an April Fool's joke. So, for me, this is the first official figure in All Over Coffee, and I'm happy with how it's working. As always with AOC, I like calm and subtle, and to introduce figures, and no text, is a shift that I wouldn't want to be dramatic. It also wasn't planned, which is, for me, the best way. I was in the museum drawing and stepped out of a gallery to see this scene. The composition was so striking that I could easily have removed the figure to do a regular strip, but this woman's presence seemed so integral to the shot. Her lonliness called to mind one of my favorite painters, Edward Hopper (not to be confused with Emit Hopper, the fictional writer who appears in AOC stories—that name similarity, by the way, is just a crazy coincidence, or possibly an unconscious homage to the painter I'm referencing here). I often think of Edward Hopper when striking tone for both my drawing and writing, and so I knew it was time to take the plunge. It's a change that's been coming for a while, really. As I'm wrapping up the second collection of All Over Coffee I'm feeling a need to take the strip some place new. During the months of June and July 2010, a show of 30x40 inch All Over Coffee prints are being shown in the SFMOMA cafe in San Francisco. This is the first of two drawings from the museum to honor my toe in the door of the MOMA. This is the second piece from the Watari-Um Contemporary Museum in Tokyo, done on a recent drawing trip to Asia. The first was about the John Lurie exhibition (see notes for strip #502), this strip features the recurring writer Emit Hopper, who shows up sporadically in All Over Coffee. Spring in Japan is known for Cherry Blossoms, and I was nervous that we were going to miss them. Which we did. We arrived April 15th, just after their early bloom. Still, seemed like a perfectly scheduled time for a drawing trip, spring; not too hot but with a low light for long shadows. But instead, winter came back and confused everyone, including the Cherry trees. It snowed the second day we were there. Not even a pretty snow, but white for half an hour, only to turn to hail then rain. So all it really meant was that it would be cold. I still managed to get a lot of good drawing in, because a discipline built on drawing outdoors means you can't use the weather as an excuse. Still, some days became more about interiors than exteriors, but either way, had it had been raining or sunny, we definitely would have visited the Watari-Um Contemporary Museum. The Watari was designed by Swiss architect Mario Botta, who also designed the San Francisco Moma, and there are some familiar elements, like stripes. The Watari, by the way, also has an excellent bookstore, On Sundays, which I'm proud to say carries my books. Their exhibition at the time was a body of drawings by musician and actor John Lurie. Incredibly moving, and I later learned that John Lurie suffers from an undiagnosed illness that for years has limited his creative output to only visual art. This added a new perspective to all the pieces, and of course, many seemed to make more sense. One measure of great work for me is a feeling of familiarity, of a truth that I feel I know but have never heard before. And a feeling that that truth is what I need to bring to my own work, which John Lurie's pieces had for me. So I had to pay homage. This is the first of many pieces to come from my recent trip to Asia, which included Tokyo and Shanghai. Looking over the tracks leaving Gare du Nord in Paris, all the trains were quietly stopped at the station on the other side of the bridge I was standing on. I thought of the artist Raymond Pettibon's series of train drawings, how the scene was the opposite of his pulsing engines, but completely aoc. The text for this strip was inspired by the novella Ghosts by Argentine writer C�sar Aira. It was coincidence that I bought this book a week before leaving for Argentina. I was in line at a bookstore in San Francisco buying another book when I saw it sitting on top of a pile that a clerk was just about to shelve. I was drawn to it because of its small size and intriguingly minimalist cover. I picked it up, read a few lines, then impulsively said to the person ringing me up, "add this please." It was only after I got home that I found out that Ghosts takes place in Buenos Aires, where I was about to head off to for almost a month.